What type of brownies do you like; cakey or fudgey? I'm a fudgey brownie kind of girl but I have many friends who like it cakey. This brownie will please everyone because the outer edges are cakey and the middle is fudgey....so this is the perfect pan of brownies to make for a crowd. The dark chocolate and orange flavours make this a more sophisticated brownie and one that will please the adults ......and kids with refined tastes. ;) Enjoy! 1. Preheat oven to 350°. Butter and flour a 13x9x2-inch baking pan, and line the bottom with parchment paper. Set aside. 2. Whisk flour, cocoa powder, cinnamon and salt in a medium bowl; set aside. 3. Place orange zest, chocolate, butter, coffee, and liqueur in a large heatproof bowl. Set bowl over a large saucepan of simmering water. Heat mixture, stirring often, until chocolate is melted and mixture is warmed through. Remove bowl from over saucepan. 4. Into the chocolate mixture, whisk in both sugars. Add eggs and vanilla; whisk gently until just blended. 5. Switching to a spatula, fold in the dry ingredients until just to blend. Scrape batter into prepared baking pan and smooth the top. Sprinkle some chocolate chips evenly over the top to garnish. 6. Bake brownies, rotating pan every 10 minutes, until a tester inserted into the center comes out with some wet crumbs attached, 30-40 minutes. Transfer to a wire rack. Let cool completely in pan. 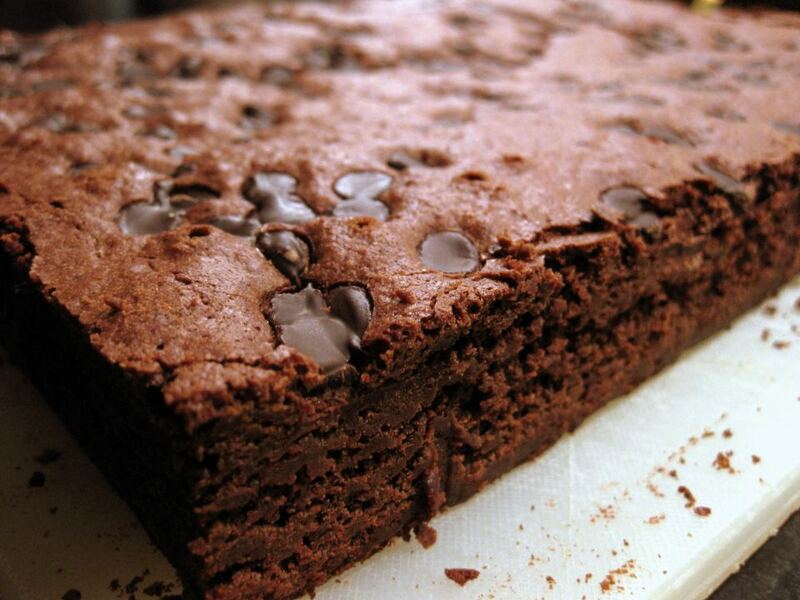 Looks like a perfect brownie. OMGoodness, chocolate and orange together, yum! And it's dark chocolate which means it's good for you, right?! I hope my boys don't like it so I can have it all. That is my kind of brownie! I love when chocolate and orange come together... and in a brownie, it's even more perfect!